On the first night of my trip to the Upper Peninsula of Michigan, Eric and I were hiking along the beach at Whitefish Point looking for a great place to photograph the sunset from. As we walked along the beach, we noticed a small shorebird up ahead. As we got our binoculars on the bird, we both realized that it was a Piping Plover and that it was walking down the beach right towards us. We quickly switched to our larger lenses and got down low to the ground to get a good angle on the approaching plover. It continued to approach us closer and closer as we began to take some photographs. It came as close as 15 feet and we were able to get some amazing shots. Below are a two of my favorites. There is just something exciting about Plovers against coarse, moint sand. They are so sweet with their little white collars. Nice captures. Great capture ... sunsets I always say are a fall back in case you don't see something more interesting, and or both. Great photos. 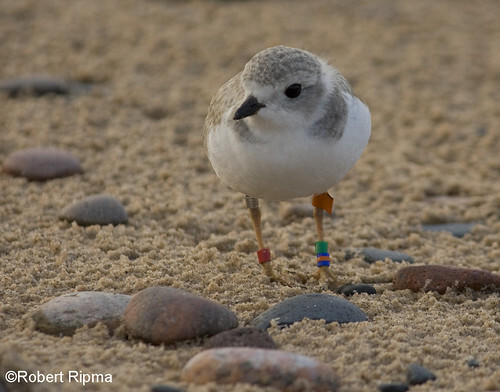 Were you able to find out where the bird was ringed/banded? 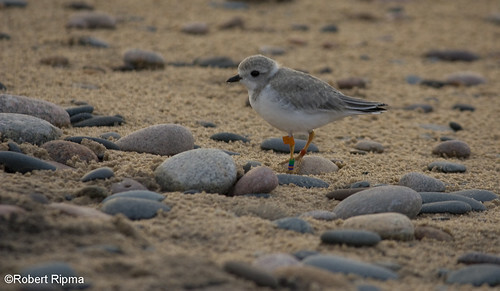 @mick We have not checked into where this individual was banded but Whitefish Point had nesting Piping Plovers this year and I would guess that this is one of the adult birds associated with the nesting. Very cute. It's easy to anthropomorphize when the facial expression looks so quizzical. Good capture! Incredible captures Rob! Getting down at eye level made such a difference in these shots of the Piping Plover. Isn't it exciting when the bird comes right at you as you click away on the camera? I love that! Excellent captures, Robert. Very cute birds. I really like the DoF in the first photo. The details in the originals are great. Cute little birds! And fabulous photos, Rob! ...these are the sweetest little birds, and your photos capture that facial expression beautifully. I love all the jewelry on those little legs! Beautiful shots! Thanks also for stopping by my CC post last week. Much appreciated and I always love catching up on what you've been taking here.